Searches represent the total number of queries conducted at the provider. Example: An estimated 6.4 billion search queries were conducted at Google Search, representing 65.7 percent of all search queries conducted during the given time period. 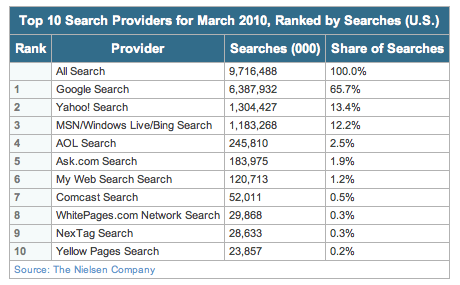 This entry was posted on April 28, 2010 at 6:59 pm and is filed under Top Ten Search Providers March 2010. You can follow any responses to this entry through the RSS 2.0 feed. You can leave a response, or trackback from your own site.